Japanese Appetite For Whale Meat Declining? Japanese cuisine is known all over the world for being one of the best. While not everyone has a liking for their more exotic dishes, staples such as tempura and sushi are well loved most everywhere that I’ve been to. One particularly exotic meat that the Japanese really love is whale meat, and it is by far the most controversial as well. Japanese fleets regularly foray into the deep waters to hunt whales for meat. It used to be that up to 5000 tonnes of meat were consumed in the country each year. Today, however, it is reported that there are still at least 3000 tonnes left in cold storage. It is but logical to say that the Japanese population is not consuming as much whale meat as it used to. Despite falling market prices, and regular government efforts to “educate” the population by way of academic lectures, food festivals, and compulsory school lunches, whale meat remains a dish that few modern Japanese have eaten more than twice. Not because it is scarce, they just don’t like it. Daiki Fukuda is owner of a traditional izakaya restaurant called Paddock, in the northern coastal prefecture of Ishikawa. His reasons for not serving whale meat are purely culinary. “It doesn’t taste good,” he says. It is pretty clear at this point that hunting whales down for profit might not last long as a practice. 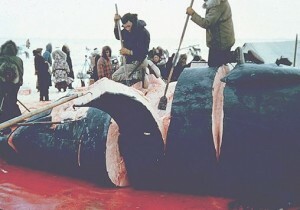 If no one buys it, who will continue to spend money on harvesting whale meat?